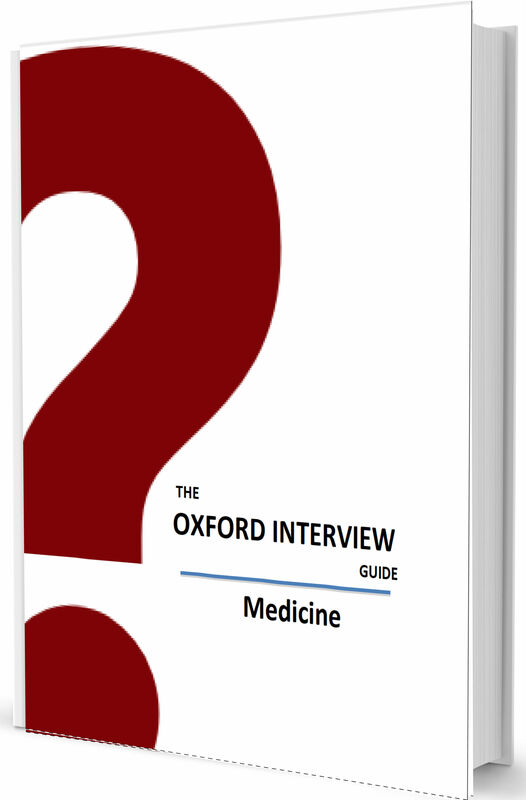 The Medicine guide discusses Oxford Interview Questions in depth with answers and approaches – along with possible points of discussion to further demonstrate your knowledge. The Medicine Guide also includes the Oxford General Interview Guide. It has been specially edited for applicants for each subject by a team of Oxford and Cambridge graduates. The Oxford Medicine Interview Guide is available to download now! Why does an egg rot? Why are there only twenty amino acids? What problems do fish face underwater? What evidence is there that humans are still evolving? Why can’t humans live forever? How has the human diet changed in the last three decades and why? What are the problems with the current taxonomy system? How would you poison someone without the police finding out? What causes the common cold and why is there no cure? How does the flu vaccine work? Why do we need ATP, why not just release energy from glucose directly? How much of human behaviour is genetically determined? What techniques could be used to date how long a disease has existed in a population? Why are explosions a risk in flour mills? What stops bags of flour exploding in the kitchen? Why do we blow on soup to cool it down? How many molecules are there in a glass of water? What issues might there be if you wanted to create a metallic oxide that has good conductive properties but is also transparent? What is the concentration of water? Why does iron rust and how can rusting be stopped? How does blood maintain its pH? Discuss the bonding in benzene. Which is more important – art or sciences? By understanding how the interview works and, crucially, what it is that the interviewer is looking for. The interviewer is not looking to catch you out, but rather for you to demonstrate your curiosity, knowledge and passion for Medicine. The easiest way to demonstrate your enthusiasm for Medicine is to show that you are self-motivated and have studied the subject in your free-time for enjoyment – for example through online lectures and independent reading. If you don’t know where to start, review our suggested reading list below. How would you design a brain? Why are cancer cells more susceptible to destruction by radiation than normal cells? What is the current government policy on health and medicine? When is Newtonian law wrong? Should someone sell their kidney? What do you think of assisted suicide? Would you give a 60 year old woman IVF treatment? Do you think that all doctors should have a disability in order to empathise with their patients? If you were in charge of the nation’s health at the time of an outbreak of an unknown virus, what would you do? What do you like most about the brain? How would you describe a human to somebody from Mars? How would you determine whether leukaemia patients have contracted the disease because of a nearby nuclear power station? What would life be like without enzymes? What is the normal level of potassium? What is it used for? How does it move in and out of cells? Are there too many people in the world? Discuss the changes doctors would have to make if euthanasia were legalised. Are disabled lives worth saving? Describe how the human nose is adapted anatomically and physiologically to perform its function? Describe the processes that occur at a synapse. Discuss the ethical dilemma of Huntingdon’s disease when one family member knows they have it and don’t want anyone else to know. Do we actually need a brain? Draw a schematic diagram of the heart and tell me about the circulatory system. Explain the respiratory system using this snorkel. Has the enhancement of medical knowledge destroyed human evolution? How would you differentiate between salt and sugar without tasting them? How can you stand upright and balanced even with your eyes closed? How could you justify the legalisation of ecstasy? How could you tell how long a disease has been prevalent in an area? How do amino acids bond to form a peptide? How do you know it is a foot and not a hand? How does blood get back from your feet to your heart? How have vets lives changed in the last 30 years? How many litres of blood does your heart pump in your lifetime? How much money should the NHS spend on palliative care? How true is it to say that the modern meal is the culmination of a long journey away from biology? How well can we compare public and private healthcare? How would you break the news to a farmer that his cow has died? How would you classify diseases? How would you stop the spread of Ebola if you were in charge? If you have the money to do either 1 heart transplant or 100 hip replacements? Which one would you do and why? If you lived in the 15th century, how would you prove that different areas of the brain have different functions? If a psychologically ill person commits a crime, are they a criminal? If I were an orange, would I rather be seedless or non-seedless? If you had a billion pounds to spend on a specific area of research, what would it be and why? If you had to give human rights to one of either chimpanzees, dogs or elephants, which would you choose? In Britain why is their a lower chance of tumours forming in cats? In you opinion, what has been most significant medical breakthrough in the last 10 years? Is euthanasia too broad a term to use? What are the different types of euthanasia? Is humour a useful skill for a doctor? Is it more important to be competent or compassionate? Is shopping the new religion? Is this a left or right foot? How do you know which side the foot is? Should every hospital have an MRI machine? Should patients always have complete autonomy? Should patients with a terminal illness be able to use an experimental drug, even if it has not yet been rigourously tested? Should placebos be used in hospitals? What about in GP-surgeries? What is the relationship between now through a vessel and its diameter? What are fluid balance charts used for? What are the dangers of an ageing population? Is ageing a disease? What are the effects of cocaine on cerebral and coronary blood flow? What are the ethical implications of genetic screening from birth? What are the most important characteristics of a good doctor? What are the two main types of stroke? What can cause strokes in young patients? What do you understand by the words perception, self-awareness and consciousness? What do you understand by the term ‘apoptosis? What else do doctors do apart from treating patients? What is a clinical trial and why are they so important? What is an ECG and how does it work? What is DNA fingerprinting and why is it used in forensics? What is the best way to tackle the obesity epidemic? What is the difference between meiosis and mitosis? What is the most important technology available in medicine? What is the normal level of Potassium in the body? For what is it used and how does it move in and out of cells? What is the point of cellular compartmentalisation? What safety precautions do medical professionals take when performing an X-ray and why? Which is better adapted- a human or a chimpanzee? Why do some people describe the NHS as the ‘jewel in the welfare crown’? Why do we need ATP? Why not just release energy from glucose directly? Why are cancer cells more susceptible to destruction by radiotherapy than regular cells? Why are we not more like bananas? Why can’t you breathe underwater through a 1 metre straw? Why do men often go bald, but women rarely do? Why do the atria contract before the ventricles? Why do we need lungs? Why do you drown faster in sea water than fresh water? Why does our heart best faster when we exercise? Why is blood red when you bleed even though your veins actually look blue? Why is sustainability so difficult to achieve? Why is the heart so well adapted to performing its role? Why is there no cure for the common cold? How does the flu vaccine work? Will 3D printing revolutionise medicine? You are with a nurse who takes blood and makes a labelling mistake on a patient who has needle phobia. What do you do? What do you say to the patient and what do you say to the nurse? What has to change from foetus to baby with regards to blood circulation? Draw the nerves from them ear to the auditory centre. Why are they like that? How good are your teachers at school then? How would you measure the weight of your own head? Why does your heart rate increase when you exercise? Why is it a disadvantage for humans to have two legs? If you were a grapefruit, would you rather be seedless or non-seedless? Describe what happens when a neuron is excited and the action potential that follows. Draw a graph to illustrate learning against time/ stage in life. Draw a cross section of a bicycle wheel. Draw another one. What do you think of the state of the NHS? What would you do to improve it? What’s the greatest medical innovation this century? How would you describe a human to a person from Mars? How would you simulate altitude in your living room?